So how did you eventually wire it up to connect to the cars wire/electronics? Meziere WP136s has been tested and tried. Flows at 20 gpm work very will with a larger heat exchanger and cost is 199. How did you end up connecting the wires, as the pump seems to be a PWM type motor? Wired it up and that was it. Works great to this day. Did your "wire up" use the voltage from the ECU or did you install a standalone circuit for the pump? Last edited by Yacht Master; 01-03-2013 at 05:26 PM. Still nice to see more pump options but I have run the Mez WP 136 on stock system, stock with H/E and now being feed with 2000 GPH rule pump and trunk tank. I have tested Johnson pumps (yuck) stock and bosch HD and none come close to what the Mez can flow. Can you flow to much on stock system? Not with any of the pumps that are listed above , as rated flow with Zero head pressure is waaaaaay different than real time flow. Even with all these big pumps, you wopuld be lucky to measure real time flow of over 6GPM. That gives your stock system about "one circulation" of water on a 1/4 mile run. That is still low IMO and most of you will only be seeing 2-3 GPM real time with your set ups that I see posted. So, I would not worry about to much flow and start working on getting more flow. I spent a lot of hours with a stop watch, gallon jug and testing flow of each set up and hose diameter size. That the only way to really know. E63 Biturbo, UPD Cold Air induction kit, UPD performance crank pulley and UPD adjustable rear suspension with ride height adjustment. CL55 UPD Cold Air Boost kit, UPD 3000 stall converter, UPD 77mm SC clutched pulley and beltwrap kit, Custom long tubes, UPD crank pulley , UPD suspension kit, UPD SC pulley, Aux. HE, Trunk tank w/rule 2000 pump, Mezeire pump, UPD 5pc idler set, Aluminum rotor hats. Hi, what do you think about the EWP 80 Water Pump? I'm a new w211 owner and I was researching intercooler upgrades when I came across this thread. I'm an engineer and I actually work for Pierburg Pump Technology... so if any of you have any more in depth questions about our products, just give me a shout and I'll see what I can rustle up. I didn't read all the posts, but is there a concern that for use with someone that has the stock location HE and stock sized HE (and even possibly a bigger HE) that it will flow too fast through the cores not allow enough time for the fluid to cool? The CWA 50 is used as a charge cooler pump on the recent BMW V8TT engine, and the CWA 200 is used as the coolant pump on a wide range of recent BM's. The circulation pumps have relatively low flow and high pressure, while the coolant pumps are obviously high flow. Like all good pumps, they're specified by their flow rate under pressure, so we know what their installed performance is going to be. Contrast that with the Meziere WP136S, which simply claims 20 gpm/76 lpm open pipe. I don't have much information about how the WP136 performs in an IC system, so I used what I could find. 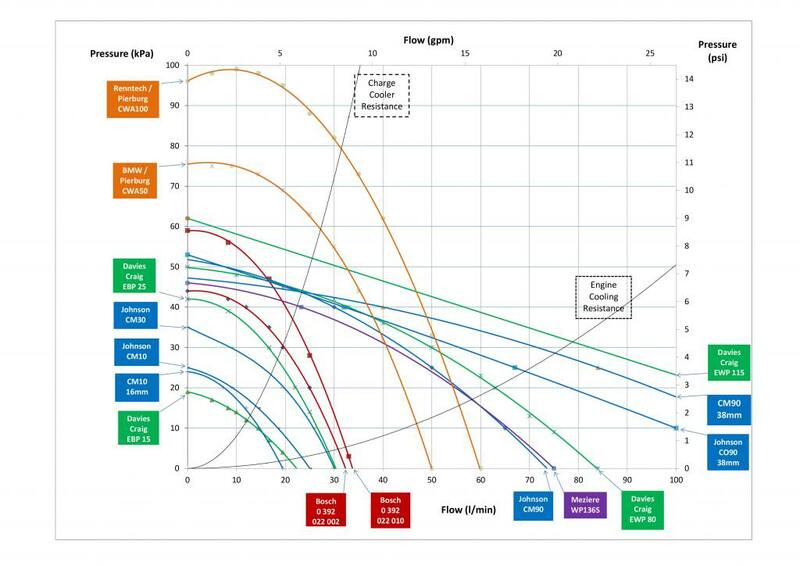 Like the Meziere, the big Johnson and Davies Craig pumps also claim high open pipe flow, but when I put the Pierburgs onto my Flow Characteristics chart, an interesting picture emerges. For the purposes of charge cooling, these pumps rock. If you look at the Charge Cooler Resistance curve, which gives an indication of the pressure/flow characteristics for a typically constricted charge cooler system, you can see which pumps will give good installed performance. The CWA 50 beats all-comers so far, and the 100 is better still, even achieving one bar pressure differential at low flow rates. For charge cooler systems, these are two meaty pumps. I believe the CWA 100 is what Renntech use for their new IC pump, and it seems to be exactly what's needed. Shame about the silly price. The CWA 200 & 400 coolant pumps are off the chart, flowing over 100 lpm, and I didn't even try to plot them. They're huge, but you can see they meet different requirements. Where the 50 & 100 (like the Bosch pumps) fit the Charge Cooler Resistance curve pretty well, the 200 & 400 are closer to the Engine Resistance characteristic. In fact, the Pierburg stats tend to back up what I've supposed are the installed characteristics for IC and engine cooling, with a big difference in the pressure/flow curves. If anything, I think the differences should be even greater, with an even steeper IC curve and a shallow coolant curve. The other thing that's interesting about the Pierburg pumps is that they facilitate electronic variable speed control. They can be slowed down almost to a stop, for fast warm-up and to save electrical power. In theory, they can control water flow well enough to avoid the need for a thermostat. That might not avoid hot spots in the engine during warm-up, so I don't believe anybody has actually implemented that yet, but it sounds ideal for a charge cooler. And here's my updated spreadsheet - note that the scales have been expanded since last time, and I've added imperial flow and pressure scales. I've been meaning to do that for weeks; its frustrating when manufactuers quote specs in so many different units; its difficult to make fair comparisons otherwise, so here they are. Last edited by Welwynnick; 04-21-2013 at 08:53 AM. Great work! Thanks for the up. is true, we have a very low resistance in our system??? Do i get that right? I've been thinking about that thread for some time. There are lots of variables, and its difficult to know how equal the comparison is. I don't know so much about the W211 intercooler, but doesn't it run off the engine coolant? Did this particular car have a split cooling system? What's the pump control algorithm? Was the pump actually running at the same time in each test? Was the system bled correctly every time the pump was changed, or was there air in the system sometimes? It could be that the WP136 just isn't very good as an IC pump. I believe Meziere make engine coolant pumps, and maybe its only Bosch and Pierburg that make proper IC pumps, that can generate the pressure needed for IC systems. My view is that the charge cooler is a high resistance system, largely because the heat exchanger is long, thin and narrow - all the things that increase circulation resistance. The other approach is that IC coolant circulation is not the bottle-neck in the overall system, as the heat-moving capacity of the coolant is greater than the heat exchangers. I've been doing some more sums on that today. Therefore uprated pumps might not make that much difference at all. I think your idea was that an over-powered circulation pump might be heating up the coolant itself, but I don't think that's an explanation. Even the best are only putting 10 - 20W of hydraulic power into the system. Granted, that energy has to go somewhere as heat, but its not a great deal of energy - certainly not when there's a big heat exchanger in the circuit, as there is here. Hydraulic power is easy to work out - its pressure in kPa times flow in litres/sec. When you look at current draw, these pumps are only 20 - 30% efficient, so cooling the pump itself may be more of a factor. None of this puts me off using a bigger pump to increase IC performance, but I think there are potentially more benefits from the HE and the pump control algorith. Last edited by Welwynnick; 04-21-2013 at 02:46 PM. I think that many charge-cooled turbo cars use continuous-running circulation pumps - Lotus Carlton, Jaguar XJR & XKR etc, and the force-fed Mercs seem to me to be at a disadvantage with their temp-controlled pumps. When looking for other pump options, like many others I found the Davies Craig pumps, especailly the EWP 80 and 115. What was particularly interesting about Davies Craig was the pump controller. This implemented thermostatic control not only of the big DC water pumps, but any EWP in principle, and allowed you to modulate the pump output and adjust the target temperature in a fairly crude way. The BMW circulation and cooling pumps discussed here are more effective and controlable, but the only way to control them is with a BMW ECU. That is (as they say on Top Gear) until now.... Last year a small German company called Tecomotive developed an electric pump controller (the tinyCWA) specifically for the Pierburg circulation and cooling pumps used by BMW: the CWA 50, 100, 200 & 400. With a suitable temperature sender, this enables thermostatic control of the BMW pumps, so that any car can benefit from the lower power loss and flexible location. Like the Davies Craig controller, you can adjust the target coolant temperature, but it has much more flexible controls. Here is the web page and here is the users manual. The pump can set to run continuously at variable speeds, it can be run manually, and the controller can display the coolant temp or the pump speed. This seems to be intended for engine cooling, but I believe it can be used with the 50W and 100W circulation pumps as well. The Tecomotive “tinyCWA” is able to control the CWA200 electric water pump (eWP) in the appropriate manner. It is suitable for cars or any other thing where smart cooling is required. When activated the controller is measuring the current coolant temperature and the rate of increase with the connected temperature sensor. With this data it then calculates the appropriate water flow and sends a signal to the pump where the internal pump electronics then set it to the right speed. This way you will always have the right pump speed for any circumstances. We developed this product with very special attention to quality, operational safety, ease of use and a very nice appearance. Last edited by Welwynnick; 05-05-2013 at 11:05 AM. Although these tests were performed on different cars: Mercedes, Cadillac & Chevy, there's a very clear conclusion to be had, and a new direction to look for suitable IC pumps. IC systems are quite unlike engine cooling systems (or buckets of water for that matter). They're all HIGH RESISTANCE systems, so they need a lot of pressure to achieve good flow. Many pumps are rated for open flow, with no load, but that's almost totally useless for chosing an IC pump. 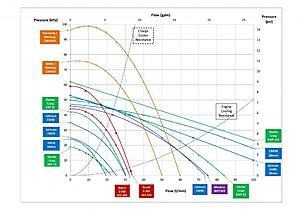 If you want to use a single figure, the static pressure (maximum head) gives a better indication of improved performance, but pumps are more complicated than that, and you really need proper flow vs pressure curves, which is where the Lingenfelter tests are so useful. There's a lot of talk about 20 gpm pumps, but 3-4 gpm is quite normal in the real world, and 5 gpm is a good figure. Its actually quite difficult to get even that high - I spent several days trying - and a high antifreeze concentration, an uncharged battery, or a tiny bit of air in the system, really knocks it back. What this means is that pumps that are suitable for engine coolling, or that do well with the bucket test, aren't really suitable for IC systems. So that includes pretty much all Johnson, Meziere & Davies-Craig pumps. So that means that all the forum favourites, like the EWP-80, WP136, CM30 or even CM90, are no improvement on the Bosch. Many people swear by the Jabsco 50840, but even that's a high-flow/low pressure pump. IC systems normally run at around 0.5 bar, and if you want more flow, you need a lot more pressure. So you need to look for pumps that do 1 bar or more, and I found a couple of real candidates. They have 15-20 gpm open flow, but they achieve up to 1.1-1.2 bar, and the installed performance will be better than ALL the above. The first is an identical twin big brother to the Jabsco 50840, called the 50860. It looks and cost about the same, has less open flow, but much more power, pressure and installed flow. The other I never heard of before - the FLOJET DC 40/10. They're both monster pumps, bigger even than the Renntech pump, and I would guess similar to the stock Stewart-EMP E2512A that Lingenfelter promote so effectively in the top thread. The CWA-200 that I use in my S600 is really being throttled by the IC's, so I decided to try a purpose-made IC pump instead. I bought a CWA-100 / A0005000486 (subject of this thread) from my local dealer, and asked him to give me a list of the other applications. I've no idea what the Vito application is, but I believe its generally used as the IC pump for the turbo-charged AMG models. It sounds like Mercedes have seen the light about the Bosch pump, leap-frogged the CWA-050 "BMW pump", and gone for broke with the best option across the board. If they were developing the E55, SL55 or S600 now, this is presumably what they would have used. Last edited by Welwynnick; 11-09-2013 at 05:34 PM. I've no idea what the Vito applicaiton is, but I believe its generally used as the IC pump for the turbo-charged AMG models. If they were developing the E55, S55 or S600 now, this is presumably what they would have used. Did you install this pump yet and do you know the pin out and plug for this pump? No; I only got it last night, and it will be some time before I can fit it. Thanks Nick, if you figure out the wiring please let us know, I would like to get this pump as well. The CWA-100 has a smaller connector than the 200, but I expect the pin-out is the same. I'll try to find out for sure. Thanks for the offer - can you tell us what is the pin-out on the CWA-100 / MB 0005000486? Hey everyone... lots of awesome information here... but for those of us that don't get our hands dirty all the time, what is the EASIEST upgraded pump to install as opposed to just replacing the stock unit? Bought a 2nd 2006 E55 in another country (central America) and shops that know how to change the oil in this car are rare, SO I need to install it myself. Which means I need to buy it in the US and take it down here on a plane... and install with remedial tools. I know, I know. Anyway, this used 2006 is great except for the heat soak after about 20 seconds of hard driving. So I suspect the pump. I changed the pulley and reprogrammed the engine myself with the Logic Lab kit (again, needed something portable), but the engine was cutting out before the mod. Now, more frequently because of increased temps. Any suggestions would be greatly appreciated! I'm about to just replace the stock unit with another stock unit at this point. If you want to replace a stock unit, be sure to use a -010 unit, rather than a -002. Otherwise the AMG pump is a great option.